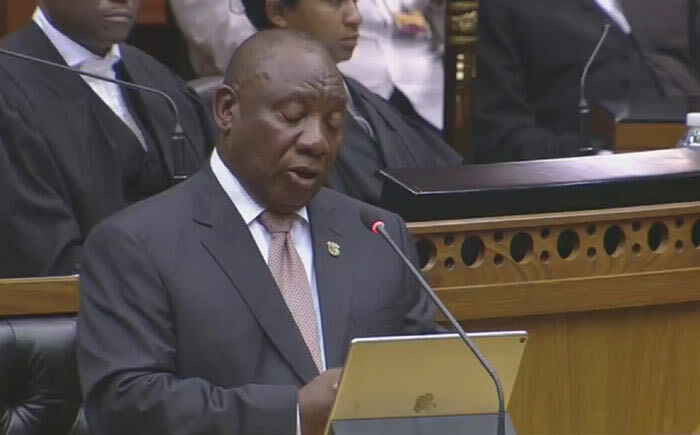 A screengrab of President Cyril Ramaphosa delivering his State of the Nation Address in the National Assembly in Parliament on 7 February 2019. President Cyril Ramaphosa had MPs in stitches when he kicked off his second State of the Nation Address (Sona) with a joke. Julius Malema challenged him to sing “Thuma Mina” after he invoked the Hugh Masekela song at last year’s Sona. He hesitated, so he claims, but in the end, decided that doing so would be unwise. If however, he said, the EFF wins the election, he would come on stage and sing. Mmusi Maimane would also be a member of the band. So, with the tension palpably lifted, he began his speech. Jobs, as always, featured prominently this year. He referred to the Presidential Jobs Summit which, when implemented, he promised, would double the number of jobs created every year. He punted his brainchild, the Youth Employment Service, which places unemployed youth in paid internships in companies across the country. Ramaphosa committed to “cure our country of the corrosive effects of corruption”. The President highlighted moves to stabilise and restore the credibility of institutions such as the National Prosecuting Authority, the South African Revenue Service and the South African Police Service. Accelerate inclusive economic growth and create jobs. Improve the education system and develop the skills that we need now and into the future. Improve the conditions of life for all South Africans, especially the poor. Step up the fight against corruption and state capture. The President underlined the early successes of his investment drive. On land, Ramaphosa highlighted the vital role that agriculture plays in the economy. He emphasised the massive areas of unproductive land that exist in South Africa and his aim to expand agricultural output and promote inclusion through land reform. As part of accelerating land reform, the Government has identified land parcels owned by the state for redistribution. On Eskom, he warned of “bold decisions and decisive action with painful consequences that will be even more devastating if we delay”. He pledged support for Eskom’s nine-point turnarounds plan, and the utility’s balance sheet “without burdening the fiscus with unmanageable debt”. Eskom will unbundle into three separate entities – generation, transmission and distribution.